Running into battle armed with a broadsword, bow, and quiver of arrows was perfectly acceptable if you were fighting in the Hundred Years’ War or fending off some orcs on Middle Earth. But when it comes to World War II, such medieval weaponry looks like child’s play next to the technology of the time. A sword isn’t the most likely of defences against rifles and tanks. However, for John Malcolm Thorpe Fleming Churchill, nicknamed “Mad Jack,” there was nothing he’d rather arm himself with than a trusty sword and bow. Born into an old Oxfordshire family, he graduated from the Royal Military Academy at Sandhurst in 1926. Before his World War II fame, Mad Jack worked as an editor of a Nairobi newspaper, a model, and a movie extra, appearing in The Thief of Bagdad due to his expertise with a bow. That same talent with archery took him to Oslo, Norway where he shot for Britain during the world championships in 1939. His medieval weaponry wasn’t just for decoration, either. During the 1940 Battle of Dunkirk—in which 300,000 troops became stranded on beaches and had to be evacuated—Churchill struck down a German soldier with a well-placed arrow. He was later seen chugging along on a motorcycle with his bow strapped to the side. A German officer’s cap was hanging on the headlight. In 1941, Mad Jack volunteered for Operation Archery, an attack on a German garrison in Norway, in which he led two companies during the battle; no word on whether or not he was able to use his bow in the aptly named operation. In the battle, he and his companies were in charge of taking out the German batteries on Maaloy Island. 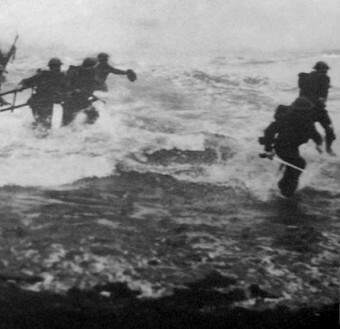 On the vessel bearing him to shore, Churchill stood at the front playing his bagpipes to the tune of “The March of the Cameron Men.” When they landed, he charged ahead of the rest of his men with his sword in hand. I maintain that, as long as you tell a German loudly and clearly what to do, if you are senior to him he will cry ‘jawohl’ (yes sir) and get on with it enthusiastically and efficiently whatever the situation. Next, Churchill was sent off to Yugoslavia where he led a series of raids against the Germans from the island of Vis. In May 1944, a bigger operation was planned involving three attacks on separate hilltop positions. Mad Jack led one group up one hill, but only six of them managed to reach the target. Jack found himself in open view of the enemy with only a few able-bodied men to defend him, so he did what any sensible soldier would have done… he played his bagpipes—“Will Ye No Come Back Again” this time—until he was knocked unconscious by German grenades and captured. Churchill was placed in Sachsenhausen concentration camp after being interrogated. The Germans had believed that he was some sort of relative of Winston Churchill, which wasn’t the case, but he was still considered a “prominent” prisoner due to his rank. As you might expect, Mad Jack wasn’t one to be kept in a prison camp. He made a run for it that September by sneaking through an old drain under the barbed wire. He and a comrade were recaptured not long after and moved to a camp in Austria. In April 1945, the Austrian camp’s lighting system failed. Churchill took advantage of the opportunity and melted into the darkness, walking away from his work detail. He simply kept walking, and eight days and 150 miles later, he ran into the armoured vehicles of the United States Army in Italy. He managed to convince them that he was a British colonel despite his scruffy appearance, and he was returned to safety. Safety wasn’t exactly something Mad Jack was after, though. He was disappointed to learn that the war was winding down and that he had missed a year of it. Rather than return home, he got himself assigned to Burma where the war against Japan was still in full swing. By the time he got over there, though, the bombs had been dropped on Nagasaki and Hiroshima, meaning that the war was basically over. The end of the war didn’t mean the end of Churchill’s adventures, though. He decided to train as a parachutist, and when he qualified, he was sent into Palestine as the second-in-command of the 1st Battalion. He later became a land-air warfare instructor in Australia, where he developed a love of surfing. He ended up retiring from the army in 1959 and died in 1996 in Surrey. In the midst of the war, Mad Jack married the daughter of a Scottish ship building baronet, Rosamund Margaret Denny. Their happy marriage produced two sons, Malcom and Rodney. Churchill was awarded two Distinguished Service Orders during his time in the military. Not one to let his eccentricities go, Mad Jack was known for throwing his briefcase out of the train window. His reasoning? He was throwing it into his backyard, which happened to be right by where the train rode past. This way, he didn’t have to lug it home from the train station. Churchill can be seen in the 1952 version of Ivanhoe. He had been hired as an archer to shoot arrows from the walls of Warwick Castle. Mad Jack once appeared on parade with an umbrella “because it is raining”—a legitimate enough excuse for any civilian, but a major faux pas in the military. He was also reprimanded for using a hot water bottle. In retaliation, he used a piece of rubber tubing instead and filled it from a hot water tap, circumventing military protocol. “But for those damn yanks the war would have gone on for another ten years? ?” Christ NO!! Or rather: Don’t bring a gun to a knife fight. Unlike a bullet, arrows can travel…rather differently. The bullet travels always straight, but arrow can be silent and do a movement on curve line. With 40 nazi soldiers listening for gunshots? No, no I wouldn’t. Further to the suitcase throwing story, previously with steam trains, Mad Jack used to simply step off when the train was outside his house. When the trains became more modern, and thus quicker and with better braking systems, the travelling speed was too prohibitive to leave the train, so throwing his suitcase was seen as a compromise instead.